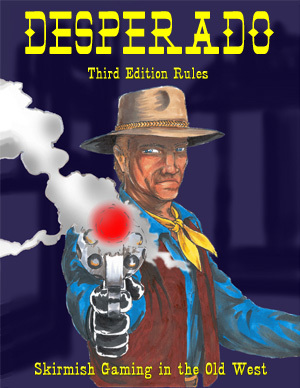 Desperado is a fast-paced, easy-to-learn, kick-in-the-pants game!! PLAYERS: as few as two or as many as twenty players (heck, if you have the time even more). TIME: 2 hours from start to finish (for an average game). Desperado can be over VERY fast if the dice are hot! Desperado Errata!! Check here for latest rule updates!! 48 Pages, 9 scenarios, Photocopiable Sheets for play!! 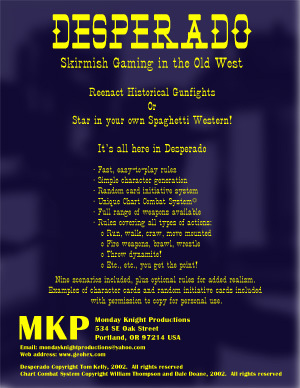 GET YOUR OWN SET OF DESPERADO DICE!